Although we can't tell you who this case was for. We can tell you that it was designed to hold 45 iPod touches, 3 MacBook Pro laptop's and an AirPort wireless router. The interior of the case features a custom CNC cut insert cut out of PE foam to allow each component its own custom compartment. This not only keeps things organized, it also allows for a quick visual scan of the case to see whether all of the components are accounted for. The interior also features a vinyl document sleeve in the lid for storing documents while the case is on the road. 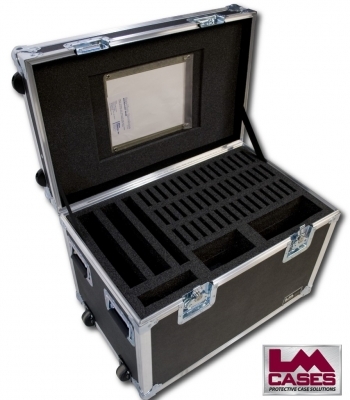 The exterior case is built out of 3/8" plywood and features our Tilt N' Travel option which consists of a telescoping aluminum handle, and inboard dolly casters. LM mounts their dolly casters between the ball corners to protect the wheels during transportation. Traditional corner casters that are riveted into the case in place of the corners. This causes the casters to take much more abuse than they are designed to and fail sooner. This premature failure is caused wheel is is absorbing direct impacts as a corner would, except unlike a corner; the wheel is not designed for such abuse. The LM design employs a proprietary backer plate behind each wheel allowing the wheel to be screwed to the case using a standard 10/32" machine screw, which is the same size as a standard rack screw. This universal mount allows the wheel to be changed in the field instead of being sent back to the factory for repair.